Sky-Engineering is a company specialized in Skyline's located in Holland. 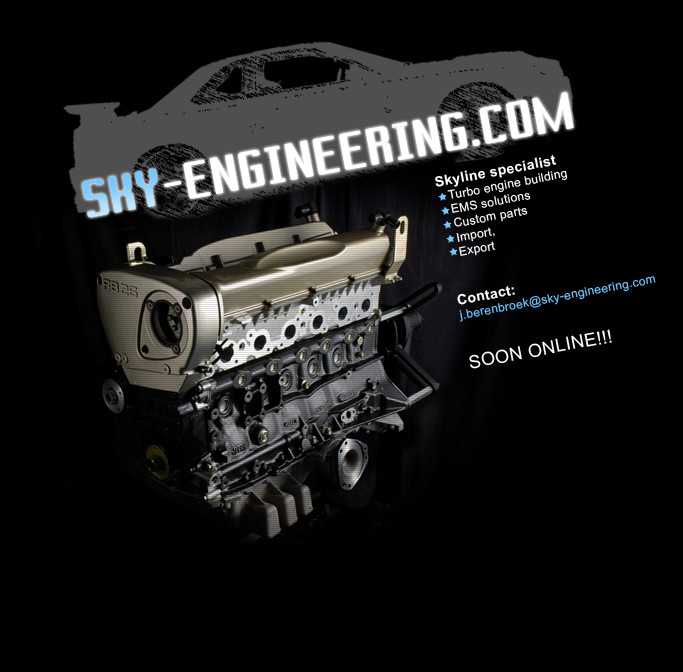 The new internetsite (http://www.sky-engineering.com) is being made at the moment, will be online soon. Our main business is building engine's (street, circuit, drift, drag, other) and ECU solutions/mapping/installing (Power FC, F Con, Autronic, Haltech, others). For all Japanese turbo cars!! We also offer a parts mail order service and import of high performance GTR's (street, circuit, drift, drag, other). At last we offer build RB26 "crate engines" (600-1200hp, 2.6-3.2 liter, 8000-12000RPM) to supply Skyline owners all over the world!! Also available: R32, R33, R34 LHD headlights for LHD country registration!! We work in cooperation with Trial co ltd JAPAN who have almost 20 years of experience in tuning Skyline's. ALL OTHER JAPANESE BRANDS WE CAN SUPPLY!! We are prepared to answer and help the Scandinavian Skyline owners with technical questions/problems they have with their Skyline. So for questions or any problem, don’t hesitate to PM, mail or call me!